You are here:Home-Blog, Social Security Attorney, Social Security Disability Benefits Louisville, Social Security Help Louisville-What Questions Does A Judge Ask At A Social Security Hearing? What Questions Does A Judge Ask At A Social Security Hearing? No one wants to go to court. It’s just a simple fact. In most instances, Going to court without an attorney is simply unwise as it carries the substantial risk of losing valuable rights. Sullivan Law Office attorneys have appeared before tribunals all over Kentucky for over forty years. 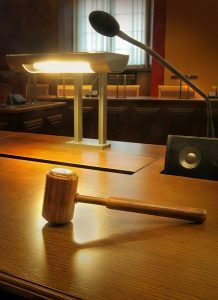 We prepare all of our clients for the daunting experience of appearing and testifying in judicial or administrative settings, whether at an informal Social Security hearing or trial in federal court. If you’ve once again been denied benefits after filing a Request for Reconsideration of an initial denial, you may continue the appeals process with a disability hearing before an Administrative Law Judge (ALJ). Such a hearing is informal and will have only you, your attorney, the judge, and probably a vocational expert and/or a medical expert in attendance at the hearing. The main purpose of the hearing is for an applicant to testify and establish evidence that meets the criteria of Social Security’s definition of disability. An ALJ will ask questions to improve his understanding of the pertinent details of your case. It is best to retain counsel to ask further questions at the hearing so as to ensure that qualifying evidence is established notwithstanding the examination of the ALJ. The ALJ will make inquiries into four specific areas of an applicant’s matter. One of the most common questions asked by an ALJ is “In your opinion, what prevents you from working?” The attorneys at the Sullivan Law Office can prepare you to comfortably and honestly answer this and all questions. These questions cover the basic details of an applicant’s personal situation. The ALJ will typically inquire into an applicant’s work history fifteen years prior to the alleged onset date up to an applicant’s last job. These questions usually involve places of employment, daily duties and responsibilities, the physical nature of the job, the latter including whether you primarily stood or sat during the day and whether or not you lifted anything. These questions involve the names and respective specialties of your doctors, the frequency of your doctor visits, details of any prolonged hospitalization, frequency of pain, affected body parts, presence of side effects, types of medications, and any circumstances which may cause your pain to increase or lessen. An ALJ needs to determine how your daily activities are affected by your disabilities, and, in essence, determine your limitations and their effect upon your ability to work. At this time the ALJ will be assessing, as he or she has done countless times before, an applicant’s honesty and credibility. The ALJ will inquire in detail as to an applicant’s daily routine from the time you awake until the time you retire at the end of the day. This may include questions about daily chores and activities, including whether you can drive and leave your residence alone. One of the best ways to improve your chances of avoiding the lengthy and complicated disability appeal process is by retaining the services of a qualified Kentucky Social Security Disability attorney. Working with an attorney that is experienced in Kentucky Social Security Disability cases ensures that you have the best chance of initially filing a successful disability application, thus avoiding the necessity of any appeal. Thus, it may be time to contact Sullivan Law Office today. We offer free consultations, so you have absolutely nothing to lose! We look forward to hearing from you. Call 888-587-0228 or visit us online.